Now Certified in Kinesio Taping! Kinesio Taping® affects the activation of the neurological system, the body's information processor and the circulatory system. 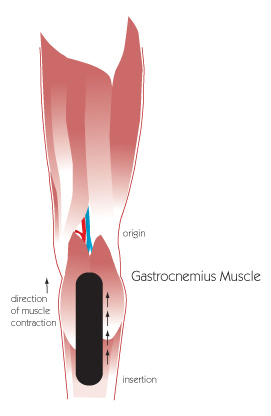 Muscles are not only attributed to the movements of the body, but they also control the circulation of venous and lymph flows, body temperature, etc. Therefore, the failure of the muscles to function properly induces various kinds of symptoms. Consequently, more attention was given to the importance of muscle function, that the idea of treating the muscles in order to activate the body's own healing process came about. Using an elastic tape, such as Kinesio Tex® Tape, it was discovered that muscles and other tissues could be helped by outside assistance. Employment of Kinesio Taping® creates a completely new and innovative approach to treating nerves, muscles and organs. The taping technique is based on the body’s own natural healing process. Rather than “strap down” the muscle, the philosophy is to give free range of motion and allow the body’s own muscular system to heal itself bio-mechanically. Application of Kinesio Tape encourages muscles to function as they would if they didn't need the tape, which improves not only body movement but circulation of venous and lymph flows, body temperature, etc. Pretty simple, but it makes perfect sense. There is, I believe, a psychological aspect as well. If your sore muscles and bones are supported and allowed to heal, you are not in as much pain and you relax. Your performance improves along with faster healing. Who would think that strategically placed elastic athletic tape would make any difference in the healing process, or athletic performance, for that matter? Well, it seems to work in a whole lot of ways. Kinesio Tape is effective in relieving carpal tunnel, arthritis, plantar fasciitis, shoulder pain, muscular facilitation or inhibition in pediatric patients, lower back strain/pain (subluxations, herniated disc), knee conditions, hamstring, groin injury, rotator cuff injury, whiplash, tennis elbow, patella tracking, pre- and post-surgical edema, ankle sprains, athletic preventative injury method, and as a support method. Price varies per application, because it depends on the amount of time and tape. Also, it does not adhere to massage lotions, so area must be cleaned, or booked as a separate appointment. 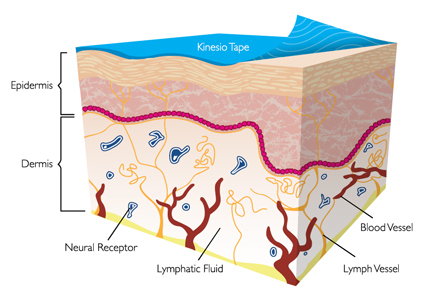 Tape can be applied as a single strip [I], or in the shapes of an "X" or "Y", depending on the shape and size of the targeted muscle(s). The basic principle of therapeutic taping for weakened muscle is to wrap the tape around the affected muscle. 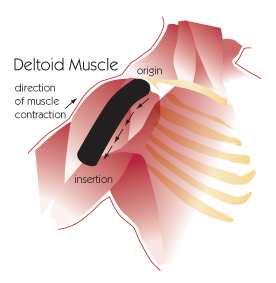 Start from where the muscle begins [ORIGIN] and continue along the muscle, and finish where the muscle ends [INSERTION]. This particular application process is typically used for supportive purposes. As the muscle fibers contract, Kinesio Tex® Tape supports the contraction by pulling and stimulating the skin and muscle back towards the point of origin. To ensure that the muscles have free range of motion, elastic tapes with an elasticity of 130-140% of its original length are recommended for Kinesio Taping®. This specific elasticity also will not allow an over stretch of the muscles themselves. It may look like conventional athletic tape, but tape and Kinesio Taping® is fundamentally different. Kinesio Taping® is based on a different philosophy that aims to give free range of motion in order to allow the body's muscular system to heal itself bio-mechanically. For preventing cramping or over-contraction (overuse of muscles), tape should be applied from [INSERTION] to [ORIGIN]. If you are treating yourself without assistance, it is important to remember the basic principle of stretching the skin before application, no matter where the pain is located. For example, if the body-side of the forearm is the source of the pain, you should bend your hand back before applying the tape. Similarly, if the source of pain is the outside of the forearm, then the wrist should be bent forward. This principle must be strictly observed. For treatment of muscle pain, Kinesio Taping® is ineffective unless the skin is stretched. This particular application process is typically used for acute conditions such as strain or sprain, muscle spasm, and edema from injury or surgical procedures. As the muscle fibers contract, the Kinesio Tex® Tape will relax or slack said muscle.